Ebony is a hard, durable, black glass-like substance that is said to be the petrified blood of a god. See the lore article for general information. 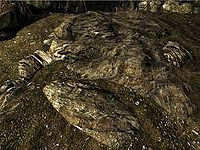 The primary ebony mine in Skyrim is Gloombound Mine, in the Orc Stronghold of Narzulbur, while the primary ebony mine in Solstheim is Raven Rock Mine. Three ebony ores are obtained by mining ebony ore veins. 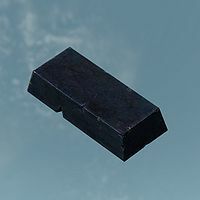 One ebony ingot is obtained by smelting two ebony ores. Ebony Smithing requires 80 Smithing skill. 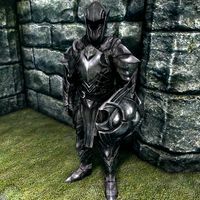 Ebony armor is level 32 heavy armor, made from ebony ingots and leather strips. Ebony weapons are level 36 weapons, made from ebony ingots and leather strips. Ebony ingots can rarely be found in chests. Ebony ingots may be sold by blacksmiths starting at level 27 and general goods merchants starting at level 14. Ebony ore may be randomly found in Falmer loot starting at level 13. Ebony ore may sometimes be found in the ash pile remains of ash spawn. These ore vein locations are also listed in the Ebony Veins category, and the exterior ore veins are shown on (map). Eastmarch Gloombound Mine 16 16 1 Mine is located inside the Orc stronghold of Narzulbur. SolstheimDB Raven Rock Mine 9 Mine is located inside the city of Raven Rock. Requires beginning The Final Descent to gain access. Winterhold Blackreach 6 Near the waterfalls to the south. Whiterun Hold Throat of the World 2 Very top of the mountain (map). Hjaalmarch Labyrinthian 1 3 Ore is in Labyrinthian Chasm; ingots are in Labyrinthian, Tribune. The Pale Shrine of Mehrunes Dagon 3 Found within the shrine. Must complete the quest Pieces of the Past. Falkreath Hold Pinewatch 1 Ore is in Pinewatch Bandit's Sanctuary. The Pale Wreck Of The Brinehammer 1 Ore is in The Brinehammer Below Deck. The Pale Raldbthar 1 Ore is in Raldbthar Deep Market. Ebony Smithing is the third perk in the heavy armor branch of the Smithing skill's perk tree. Unlocking it requires a minimum Smithing skill of 80, and the Orcish Smithing perk must have already been unlocked. It allows both ebony armor and ebony weapons to be crafted. The Ebony Smithing perk also causes tempering of ebony weapons and armor to be twice as effective. This perk applies to both unenchanted ebony gear and enchanted gear (generic armor, generic weapons, or custom), as long as the Arcane Blacksmith perk has been unlocked. Tempering of the Savior's Hide is also improved by Ebony Smithing, even though it does not use an ebony ingot. With the addition of the Dragonborn add-on, Ebony Smithing is required in order to craft stalhrim weapons and armor. 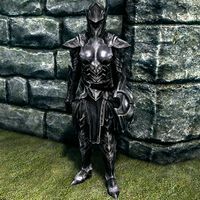 Ebony armor is the third-best heavy armor, behind dragonplate and Daedric armors. It appears in leveled lists starting at level 32 (enchanted varieties at level 33). All items can be tempered using one ebony ingot, and having the Ebony Smithing perk doubles the quality improvement. Ebony armor is unaffected by the Heavy Armor perk Matching Set. This bug is fixed by version 1.9 of the Official Skyrim Patch. In third person view, a male wearing ebony armor has an uncovered gap with visible skin around the neck area. In third person view, the head of a male wearing an ebony helmet will not cast a shadow. This bug is fixed by version 1.2.2 of the Unofficial Skyrim Patch. An ebony shield will be invisible if the person wearing it is a vampire. Ebony weapons are generally the second-best standard weapons in the original version of the game, behind only Daedric weapons. However, the ebony mace and ebony war axe are actually slightly better than their Daedric equivalents. These two weapons have identical damage statistics to the Daedric versions, but weigh less and do not require the use of a valuable Daedra Heart to create, making them somewhat better overall, something changed by the Unofficial Skyrim Patch. The Dawnguard add-on introduces dragonbone weapons, making ebony the third-best standard of weapon. Ebony weapons appear in leveled lists starting at level 36 (enchanted varieties at level 37). All items except ammunition can be tempered using one ebony ingot, and having the Ebony Smithing perk doubles the quality improvement. Arrows can only be smithed if the Dawnguard add-on has been installed. †In earlier versions of the game, the speed of an ebony dagger is 1 instead of 1.3. This bug also applies to all generic enchanted ebony daggers. This bug is fixed by version 1.5.24 of the Official Skyrim Patch. ‡The Ebony War Axe has an incorrect damage value of 15, the same as Daedric War Axe. It should be 14. ††The Ebony Mace has an incorrect damage of 16 when it should be 15. Also, critical damage is 8 when it should be 7. Ebony ore can be sold to Dushnamub for the quest Mine Ore.
Ebony ingots are needed to create and temper Daedric armor and weapons, and to create a random enchanted armor or weapon at the Atronach Forge. Several artifacts and unique weapons are tempered using ebony ingots. This page was last modified on 10 April 2018, at 18:12.